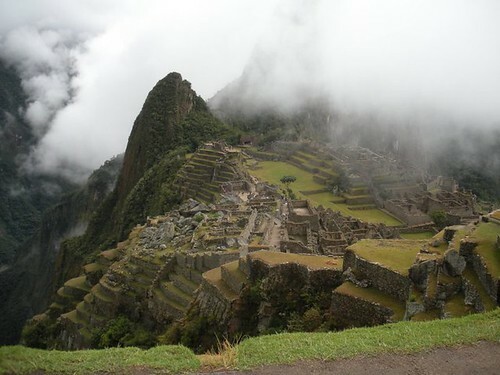 Since the whole point of our trip was to visit Machu Picchu, I thought I would write about it before moving on to other aspects of our trip. 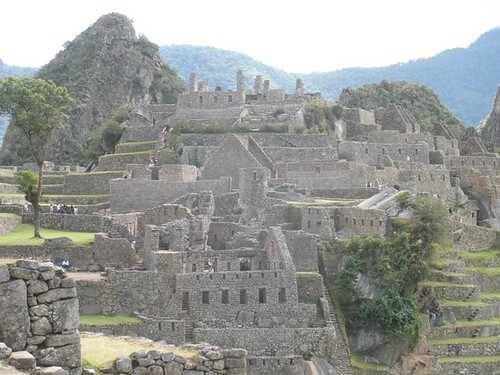 We arrived in Cusco last Monday, and stayed there until Wednesday morning, when we caught the train to Aguas Calientes, a small town nestled in the base of the mountains below Machu Picchu. 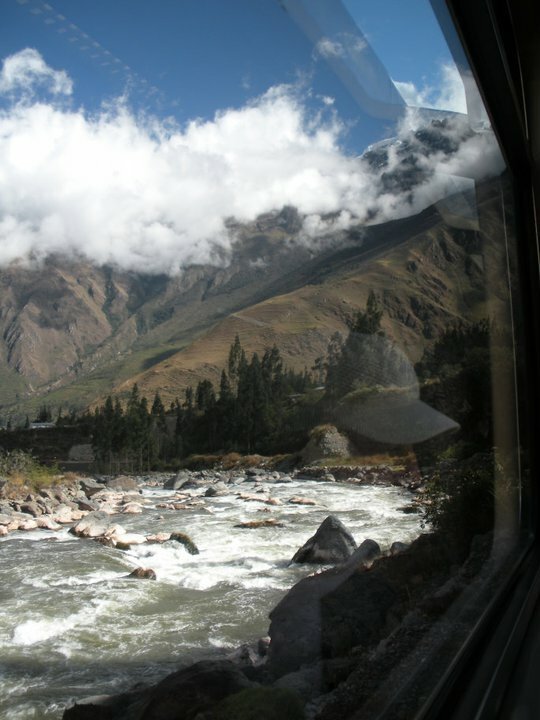 The train trip was exciting, since the views were breathtaking: mountains, Inca terraces, and rivers illustrate a) just how difficult the terrain is and b) how impressive it is that the Inca were able to settle here. 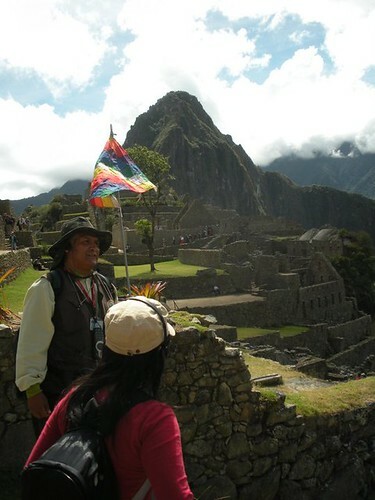 Almost as soon as our train arrived at Aguas Calientes, where our transit officer met us at the station and had us give our backpacks to the hotel porter, we met up with our tour guide and a small group of tourists and were on the bus up to Machu Picchu. 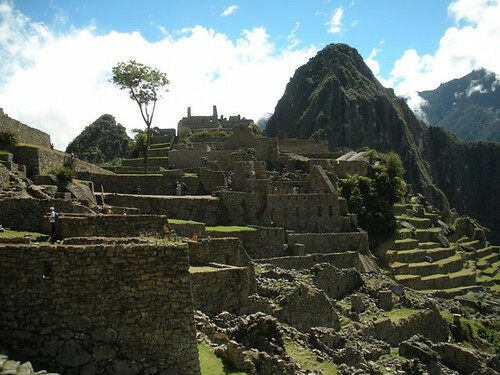 Machu Picchu is a small town built by the Incas in the fifteen century. 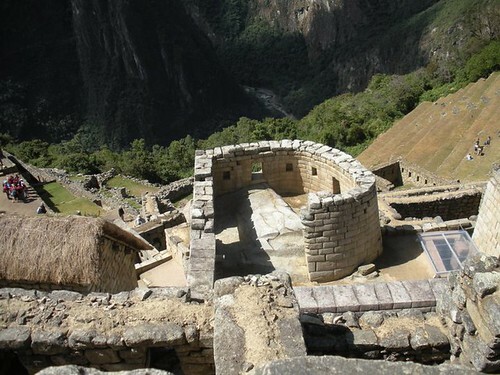 It probably served as a palace complex or summer retreat for the Inca emperor Pachacuti (1438–1472). 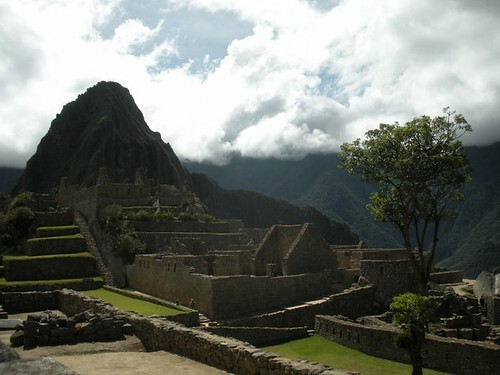 The city was built on a mountain that lies between two other mountains: Machu Picchu and Huayna Picchu. The city takes its name from the former. The city was obviously very easy to defend, due to its altitude of 7,970 ft above sea level. Originally there were two high altitude paths to the city, both of which could be easily blocked from invaders. 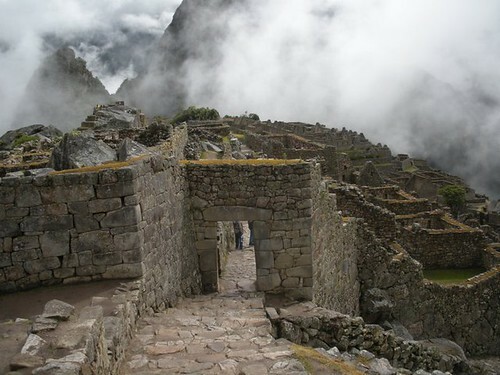 The Incas abandoned the site about a hundred years later when the Spanish invaded their territory and began conquering them. 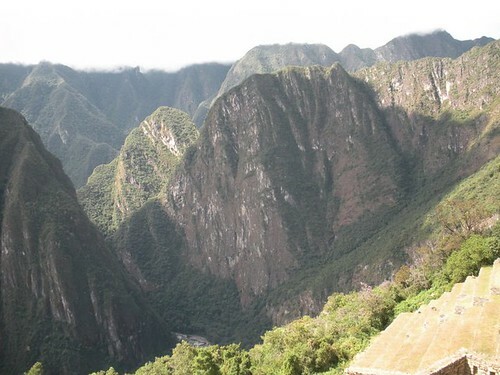 The Incas simply cut off the trails that led to the city, and the Spanish never found it, since it’s completely invisible from the valley below. 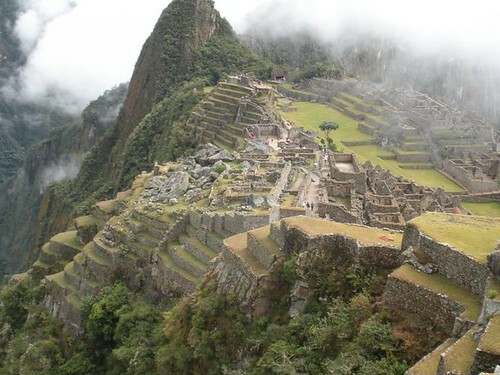 The modern discovery of Machu Picchu occurred in July 1911 (this month is the centennial), when Hiram Bingham, a Yale lecturer and adventurer, stumbled across it while looking for another Inca site. Although initially he didn’t know what he has discovered, after about a year he knew what he had found, and excavation of the site, which had been reclaimed by the jungle, began. A road up to the city was constructed in 1948, which created a means for tourism. Restoration of the site began in the 1970s, and workers continue to work on its preservation. 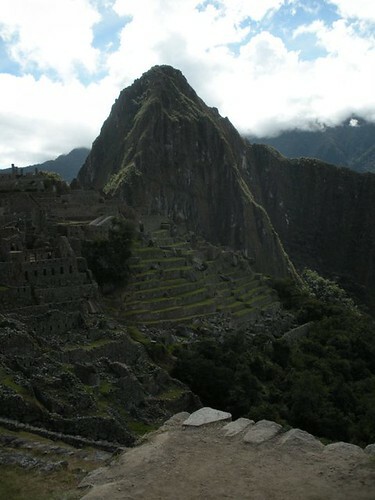 Machu Picchu is simply breathtaking. 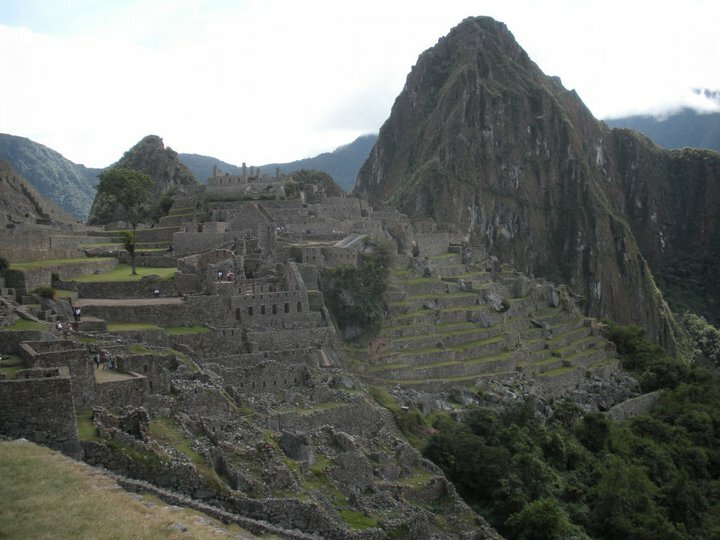 The views are incredible, and its nothing less than amazing to see what the Incas were able to achieve here. 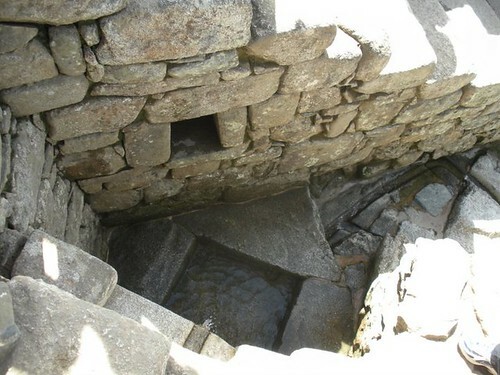 Their knowledge of engineering and construction was well beyond that of their Spanish invaders, despite the fact that they didn’t know how to make iron. 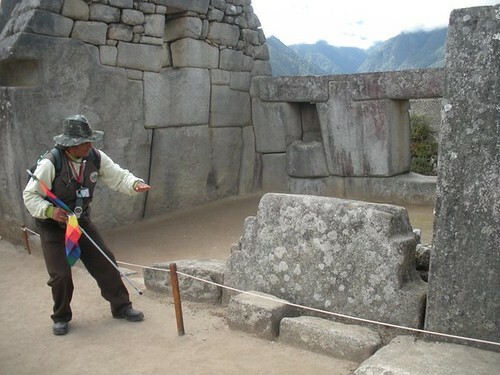 When your realize that the entire city was built with stone and light metal tools, it seems impossible that they were able to construct it — especially since most of the stone, some of which weighed several tons, came from neighboring mountains rather than from the site itself. For the rest of this post, I’ll just include random pictures from the trip with brief captions. This is just a small sampling of the hundreds of pictures we took. 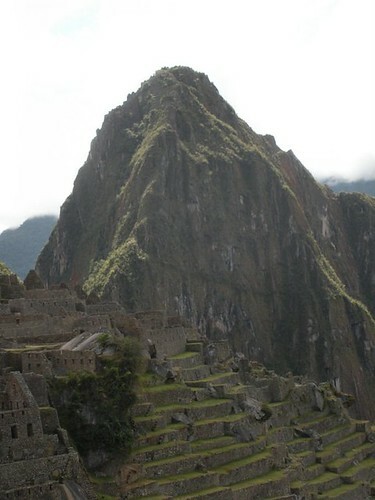 Machu Picchu with some people to give a relative sense of scale. 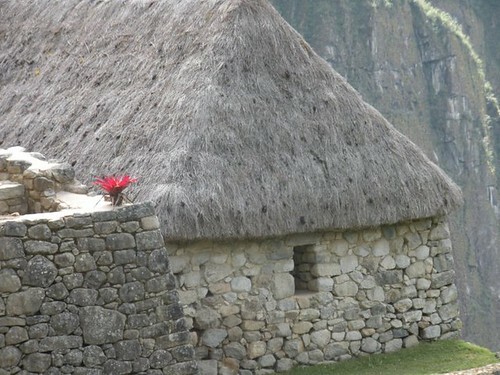 The Incas used thatched roofs for their buildings. 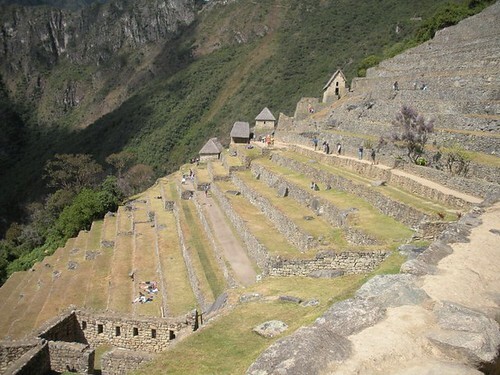 Another view of the Inca terraces. 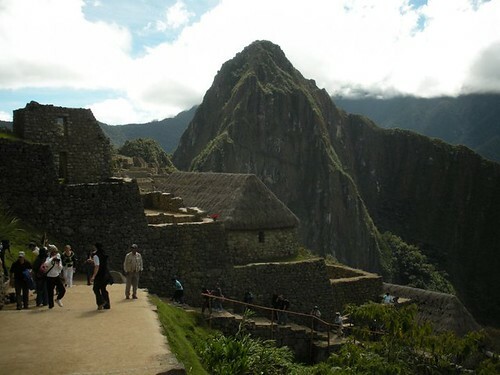 Up to 200 tourists a day can hike up Huayna Picchu. We didn't try it. Our tour guide, Darwin Paredes. 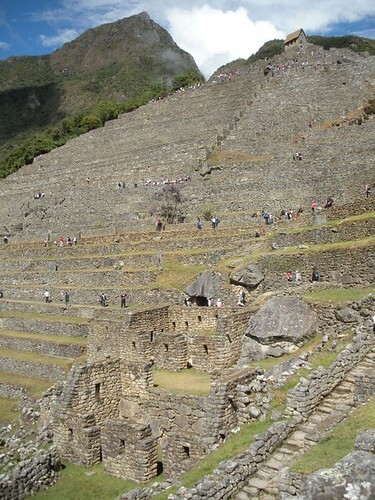 Another view of the Inca terraces, which made the steep mountain useful for agriculture, prevented soil erosion, and helped protect against invasion. 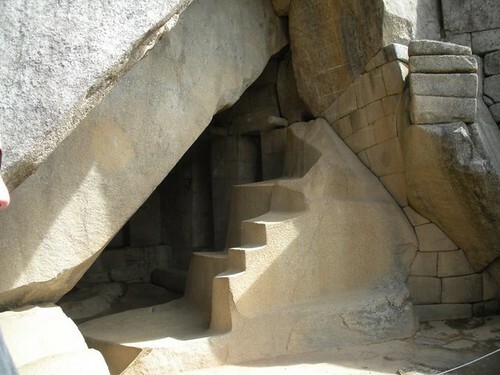 This was a tomb for the Incas. A sense of the difficulty of the terrain. The city has its own springs. The city was literally in the clouds. 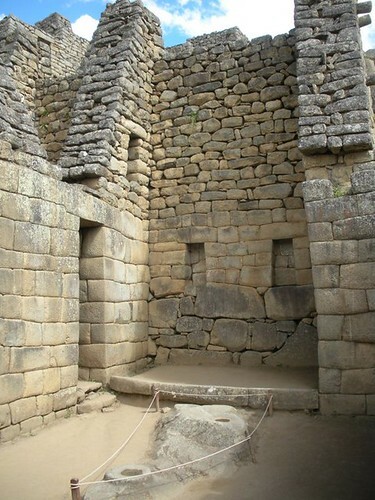 The Incas used larger stones at the bottom of walls and then smaller ones at the top. This room was the emperor's private quarters. It had a separate sleeping area and a rare indoor bathroom. This area is currently being restored. 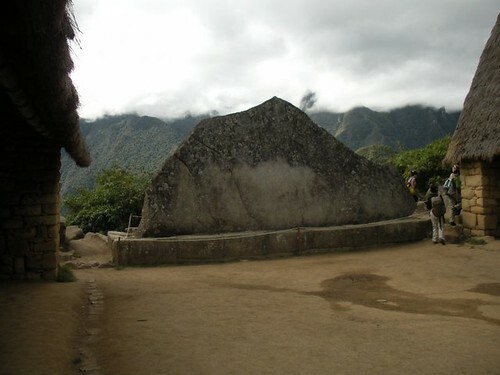 It's the very important Temple of the Sun. Darwin, our guide, talking about the Temple of the Three Windows. This is the sacred stone. 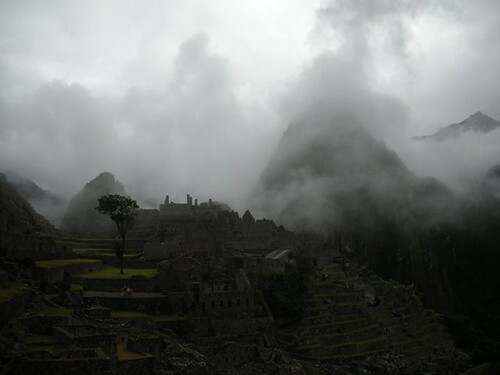 On Thursday morning, which was rainy, Machu Picchu was covered in clouds when we first got there. 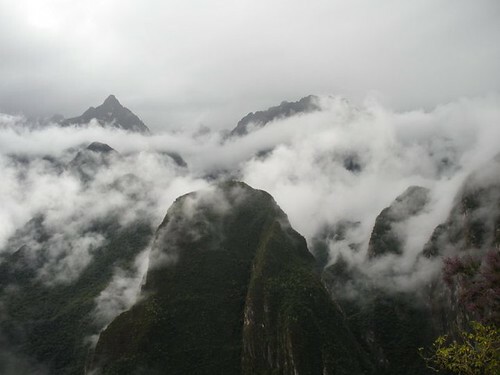 More clouds surrounding Machu Picchu in the morning. The main door into the city. 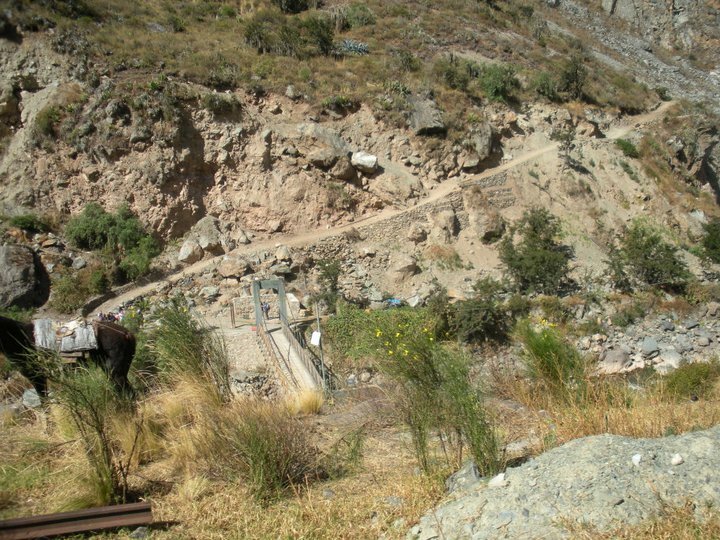 We walked along the trail to the Inca Bridge. The trail takes you above the city. Another view from higher up the mountain. 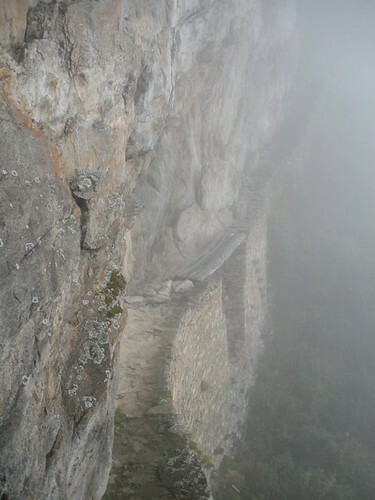 The Inca Bridge -- walking along the trail repeatedly triggered my vertigo. It's crazy how high up it is and how easily one could simply fall over the side of the mountain. Hopefully the people give a sense of scale here. You can see the larger album of pictures by going to my Flickr page (link on the left side of my blog).